Multichannel retailing is growing explosively, moving pro-active retailers to reinvent the role of traditional stores and fulfillment. Walmart, for example, is experimenting with smartphone check-out, while Macy’s offers in-store customers the ability to have items delivered from a different location when not available at point of purchase. 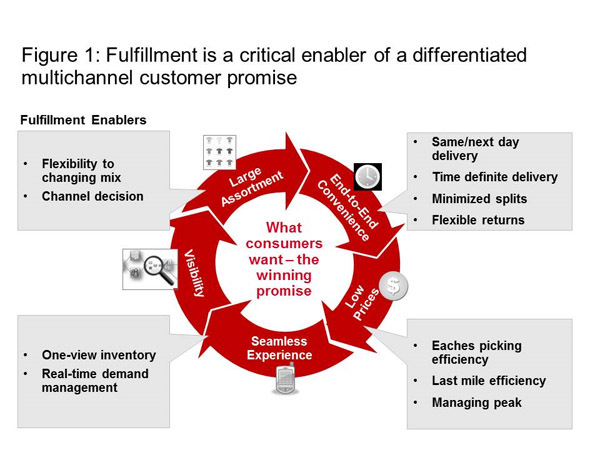 But regardless of the consumer promise, a successful multichannel strategy requires best-in-class fulfillment enablers for competitive differentiation (see Figure 1). Getting fulfillment right is much more mission-critical in a multichannel setting compared to a traditional brick and mortar setting. Fulfillment represents significantly higher costs in multi-channel—up to 18 per cent of online-order revenue, about four times the proportion for traditional channels. Fulfillment also carries more brand impact than traditional settings, as customers rely increasingly on receiving orders quickly and accurately. 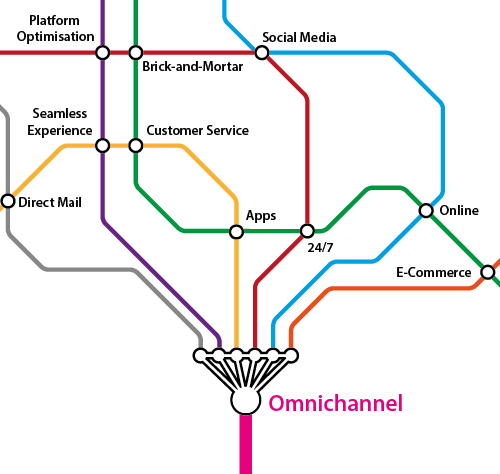 Despite its strategic importance, too many retailers still lack an effective multichannel fulfillment strategy. Our work with clients suggests a clear separation between multichannel fulfillment leaders and the also-rans. We define multichannel leaders as retailers with multichannel sales growth significantly above the industry average CAGR of 15 per cent over the past three years. Leaders also display faster service levels, a fulfillment-cost advantage over 25 per cent and a greater ability to handle category/demand flexibility. These operational and efficiency advantages translate to increased strategic and category flexibility to address changing market conditions, driving enhanced performance. This article discusses these best practices while illuminating common pitfalls that get in the way of strategic multichannel fulfillment. Unlocking fulfillment excellence means creating a two-way, iterative process in which the customer promise informs fulfillment solution, and vice-versa. In other words, to develop the best fulfillment solution in a multichannel setting, companies need a clear understanding of their customer promise. That means being able to answer myriad interrelated questions. Should we offer endless aisle assortment with free two-day shipping? Should we establish local-store-pickup options for urban customers? Could we expand with an online subscription service? 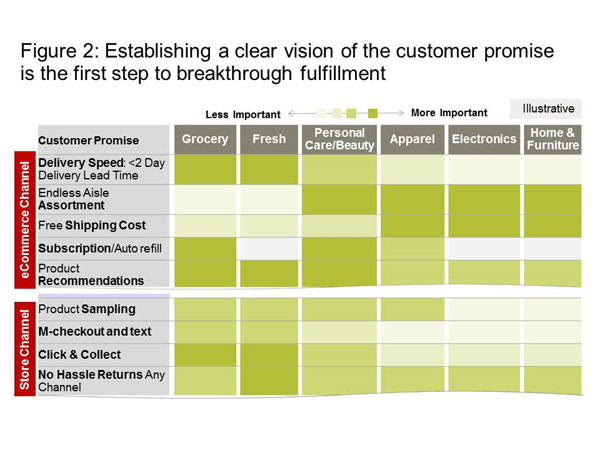 Not surprisingly, fulfillment leaders have a multi-year strategic vision for what they aspire to offer by customer segment and product category to create a differentiated multichannel value proposition (see Figure 2). This clarity of vision is required to build a corresponding fit-for-purpose fulfillment solution. The fulfillment solution will include the network nodes (the number and location of warehouses and stores required for multichannel fulfillment), the role of each physical facility and how orders flow through the system, including processes such as vendor-to-home and warehouse-to-store. These dimensions need to be anchored on the customer-promise vision. A company that envisions offering only a small set of items to targeted buyers on a subscription basis (such as farming products to rural customers) will require a very different fulfillment solution than a company offering a wide product assortment to diverse segments. As a result, where and how a business chooses to play will help determine what dimensions of the customer promise drive long-term strategy, which in turn determines fulfillment-solution needs and costs. Amazon has doubled down on the speed element of its value proposition in recent years by adding numerous new one-million-square-foot facilities to its network of warehouses, placing them closer to large urban demand hubs to enable next-day shipping of its massive product assortment to the majority of U.S. regions. Walmart and Nordstrom, meanwhile, are moving to better support delivery speed while optimizing fulfillment cost and inventory with multi-tiered fulfillment networks that leverage existing store assets. To enable same-day delivery across a limited set of high-velocity SKUs (such as electronics), they are deploying stores as mini-fulfillment warehouses. To fulfill lower-velocity SKUs (such as non-traditional-sized apparel), they are complementing store-based fulfillment with several strategically located distribution centers that will enable next- and two-day delivery. 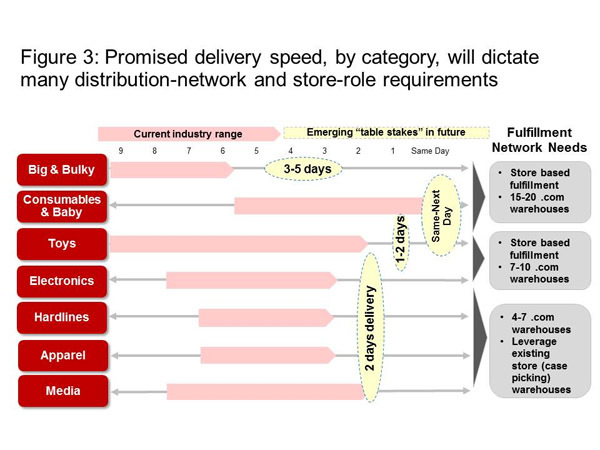 This focus on speed times impacts fulfillment-network design significantly (see Figure 3). If a firm wants to differentiate on delivery speed across a wide range of product categories, it will likely need a network of 15-20 dedicated eaches-picking warehouses and close-to-demand store-fulfillment assets and capabilities to provide adequate coverage. Other businesses may choose to differentiate with long-tail assortment products or high-touch customer services, which call for a more centralized-footprint warehouse network. 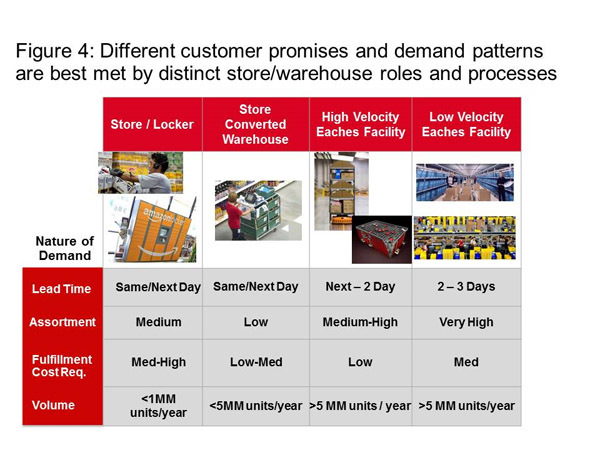 Selecting the appropriate order-picking solution within multichannel fulfillment warehouses and stores is another critical consideration dependent on promised speed and underlying demand (see Figure 4). If a fulfillment asset serves over five million units in annual sales demand across a 25,000 to 100,000 online SKU assortment within a two-day demand area, it will likely need an automated eaches-picking technology with high-speed sorters to drive operational and cost efficiency. It will also likely require sufficient demand volume to justify the related high capital investment and fixed-cost amortization. If, on the other hand, the facility is serving a much lower level of demand (such as 500,000 annual units across up to 15,000 SKUs with promised next-day delivery), then a lower-CAPEX solution such as cart-based picking (direct from store shelves) would be optimal to balance cost with picking efficiency. Now, consider the following case. Discussing whether they should expand their company’s assortment of online consumables, a merchandising team suggested that adding 45,000 online SKUs with next-day-delivery options could drive 40 per cent category growth. Because the majority of SKUs in question weren’t offered in stores, the supply chain group developed a network-model analysis that suggested the orders would require distribution through the company’s e-commerce centers. Furthermore, offering next-day coverage on the expanded assortment year-round would require an additional 200,000 square feet of incremental fulfillment space, which translated to over $200 million in capital cost, not to mention the additional cost of descaling operations in the larger facilities during non-peak seasons. Based on the analysis, the supply chain team suggested limiting the next-day-delivery promise to non-peak season orders only, which could minimize capital-investment needs and drive fulfillment efficiency by improving off-peak fixed-cost utilization. Through this iterative process, management was able to simultaneously define the company’s future customer promise and the related fulfillment solution requirements to optimize end-to-end sales, cost-to-serve and ROA. This example illustrates how elements of the fulfillment system today can and should be used to refine or even define the customer promise and associated strategies. There is a clear need for companies to experiment proactively with fulfillment solutions in an increasingly digital marketplace. Our research suggests companies that design and deploy optimal fulfillment networks and eaches-picking solutions enjoy a 20 to 30 per cent cost advantage over peers. Optimizing the picking technology and solution is also critical to ensure attractive multichannel ROIC. Even the most thoughtful, fact-based fulfillment system anchored on today’s customer promise and strategy needs to have built-in flexibility to allow for the evolution of key dimensions (target customers, products, speed, etc.). Fulfillment leaders not only design fit-for-purpose solutions; they also harness a sequenced solution build-out with sufficient flexibility to adapt to changing conditions. Others fall into the trap of building quickly ahead of demand expectations and maintaining confidence that the future market will behave as predicted by five-year plans. As a result, they often find that fulfillment assets and capabilities fail to address shifting consumer needs or changing competitive dynamics. Understanding this reality, effective multichannel organizations adopt an adaptable and agile fulfillment solution. Fulfillment leaders ensure adaptability by adopting a “no-regrets” fulfillment build-out, staging development of the system over time to maximize both the investment and flexibility to deal with changing market conditions. To illustrate, consider a U.S. organization facing three realistic future market scenarios (see Figure 5). In scenario S1, the organization’s winning strategy is to focus on serving rural and suburban customers by offering two-day delivery across fast-moving conveyable products. S2 involves serving coastal urban demand with slower-moving SKUs while S3 is about targeting the East Coast with faster delivery times. 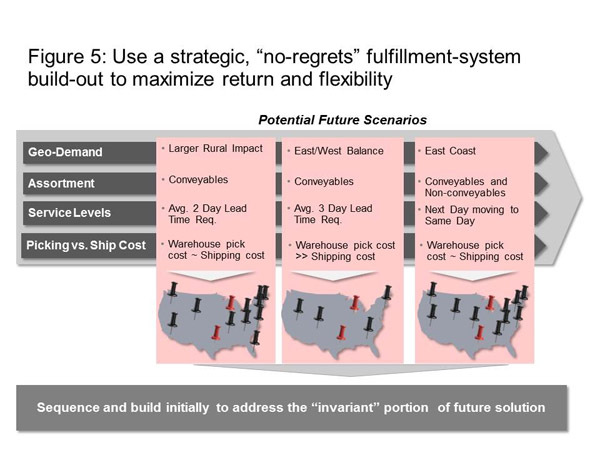 While differing on key dimensions, all three scenarios would be well-served by fulfillment solutions including warehouse assets denoted by the red pins in the figure. These anchor facilities would serve either high-demand or non-core regions, depending on which scenario becomes reality. Thus the company could engage in a cost-effective, no-regrets fulfillment build-out that includes the red-pin assets. Fulfillment leaders also ensure solution agility by using external partners to enhance capability and asset flexibility. For example, third-party logistics providers (3PLs) can be harnessed as “pop-up” capacity to increase seasonal peak sales. Strategic 3PLs can also be leveraged to introduce best operational practices and serve as a valuable source of experiential learning to enter new product categories. On the vendor side, suppliers can help provide channel flexibility and offer direct-to-consumer shipment of long-tail and concept SKUs. In short, effectively orchestrating external fulfillment partners and leveraging third-party fulfillment channels can help an organization expand into new categories or markets, optimize cost and invest with demand. Despite the promise of strategic partnerships, many organizations fail to leverage them optimally. In one example, a U.S. specialty retailer was overly focused on using the vendor-direct-ship channel to generate profitable sales for glassware products while minimizing the cost of holding inventory in its own network. In pursuit of low-cost supplier-direct shipping, the retailer failed to take into account the more holistic nature of related demand. Indeed, a significant portion of sales was represented by wedding orders with a high basket affinity (such as glassware with accompanying china or utensil sets since customers tended to order these products together). While relying on supplier-direct shipping, the retailer was forced to fulfill a portion of orders through its internal network. Splitting the order doubled the outbound shipping cost and forced customers to wait for separate deliveries. Furthermore, the majority of orders were non-seasonal, so the retailer would have been able to amortize its owned network’s fixed costs better by just using its internal system. In short, the retailer left significant value on the table by failing to understand the complete demand picture. Contrast the above example to the experience of one of our European clients. An apparel company wished to expand its online offering to the U.S. market about three years ago, but it had limited fulfillment and warehouse design experience overseas and was uncertain about its initial U.S. demand forecast. It opted to partner with a strategic 3PL that had strong e-commerce capabilities in the target market. After two years of steady growth and enhanced understanding of its fulfillment warehousing and logistics requirements, the client decided to invest in in-house operations to expand capacity. By first leveraging a strategic 3PL and transferring the knowledge required for developing internal capabilities, this retailer was able to enter the U.S. rapidly and still optimize its fulfillment cost, profit and ROIC long-term. Simply put, fulfillment leaders develop the right mix of fulfillment channels and make ongoing modifications based on shifts in demand and their capabilities. 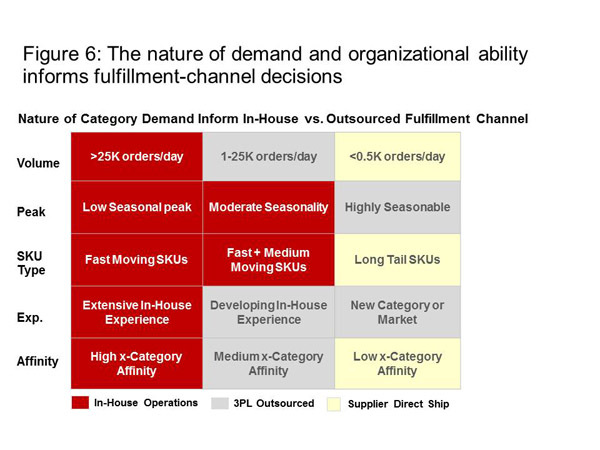 To establish the optimal balance of in-house, 3PL, and supplier-direct fulfillment channels anchored on the underlying order demand profile (illustrated in Figure 6). Traditional retail environments required courteous, effective service from associates. Success was measured almost exclusively by associate and same-store sales. In a multichannel world, roles have expanded and boundaries have blurred. Today’s in-store associates may be expected to pull items from shelves to complete online or mobile orders. And in that sense, every store is a potential warehouse requiring eaches-picking processes. But while new in-store roles can help deliver better fulfillment across channels, they can also take away from the in-store service experience. As a result, incentives need to reflect these shifts and encourage the right behaviors. However, even players that get the promise-strategy-fulfillment link can stumble when it comes to fulfillment-related metrics and incentives. Part of the problem is that traditional single-channel-focused teams and reporting structures create silo mentalities and conflicts of interest across channels. To overcome these barriers, multichannel fulfillment leaders experiment aggressively with shared incentives to encourage cross-functional and cross-channel collaboration. While specific incentives and KPIs differ depending on the underlying multichannel objectives, the following best-practice themes have emerged in this area. Establish multichannel financial incentives: Single-channel financial measures such as same-store sales or store operating profit hinder cross-channel coordination. For example, these traditional metrics might discourage store associates from taking the time to perform critical value-adding cross-channel activities such as store fulfillment of online orders or prioritizing the execution of click-and-collect to minimize customer wait time and confusion when arriving at the store for order pick-up. Adoption of shared financial performance ownership across channels is a must. One solution is to tie the performance bonus of store associates and their ecommerce warehouse colleagues to a set of common financial performance targets in a given geographic trading zone, typically anchored on a major urban demand postal code and a surrounding one- to two-day delivery radius. Balance growth and profit: Traditional brick-and-mortar businesses over-focus on sweating assets and operational efficiency and discourage growth initiatives. Alternatively, excessive focus on delighting the customer with multichannel offerings—often through a “blank check” approach—without the appropriate profit and ROIC KPIs can result in under-investment in appropriate fulfillment capabilities or over-engineering of the fulfillment-network design. Leaders find the right balance between measuring growth and profit incentives to ensure scalable and profitable multichannel operations, often by focusing an offering or category area on growth for the first year or so, followed by seeking balanced growth and profit performance. Define leading multichannel KPIs: In addition to lagging financial metrics, fulfillment leaders also measure key multichannel KPIs (such as end-to-end fulfillment cost/unit by channel flows) and product categories (such as online home delivery for appliances, click-and-collect consumable orders and store fulfillment of online apparel orders). Basket size and units/order by product category should also be considered because increasing units/order is directly correlated with unlocking scale efficiencies in pick-and-pack fulfillment cost. Online apparel orders typically need to clear 1.5 units/order for attractive cost-to-serve economics, while web and mobile consumable orders typically need to represent more than 4 units/basket given the lower average unit retail price. Lastly, multichannel operations should consider inventory accuracy, or the percentage of orders in a given geographic area that can actually be fulfilled by a warehouse or store asset within the required service-delivery lead-time window of the originating demand. Accurate inventory allocation ensures timely service, reduces split orders, and minimizes outbound logistics cost. In short, leading multichannel KPIs serve as the proverbial canary in the coal mine, tracking fulfillment-system success more proactively than lagging financial metrics. The rise of multichannel retail has meant challenges and opportunities for players in the sector. Those who wield fulfillment as a powerful secret weapon—especially using best fulfillment practices like those of the Leaders we have studied—can break through to much higher levels of performance along multiple dimensions for multichannel success.